If the thought of tax season furrows your brow, you’ll be relieved to know that, as a ClassJuggler customer, you can simplify the process by using our financial reports for schools to get the information you need. Company Billing – Use this report for ACCRUAL based accounting. This report provides you with a list of charges you have posted in a particular period of time (which you can specify). The report only shows what you have posted in charges, and not what has been paid or not paid by your customers, which makes this your go-to report if you use accrual-based accounting for your bookkeeping. If you logged $1,000 in tuition and $200 in merchandise in the month you are reporting, this report would display the details of those charges and show a net amount of $1,200.00 of income. 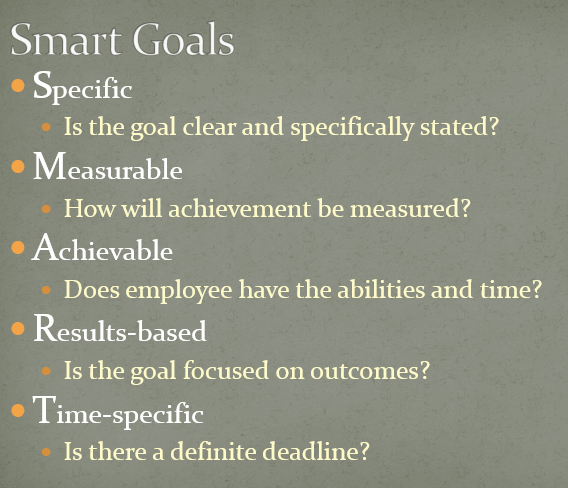 Use this report for CASH based accounting. 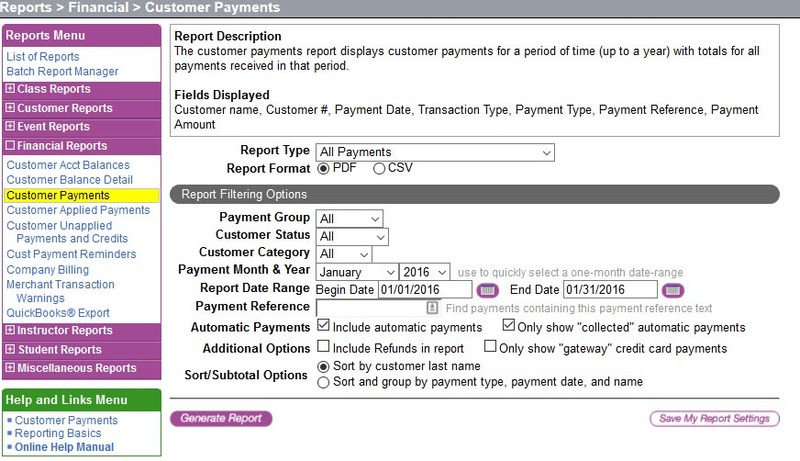 It shows you exactly how much money you received/earned in the time period you select for the report, based on those payments being received. If you posted $1,000 in tuition plus $200 in merchandise in the month you are reporting, but you only received payments on $900.00 of those charges, this report would display a net amount of $900.00 of income. Need more information on these reports? 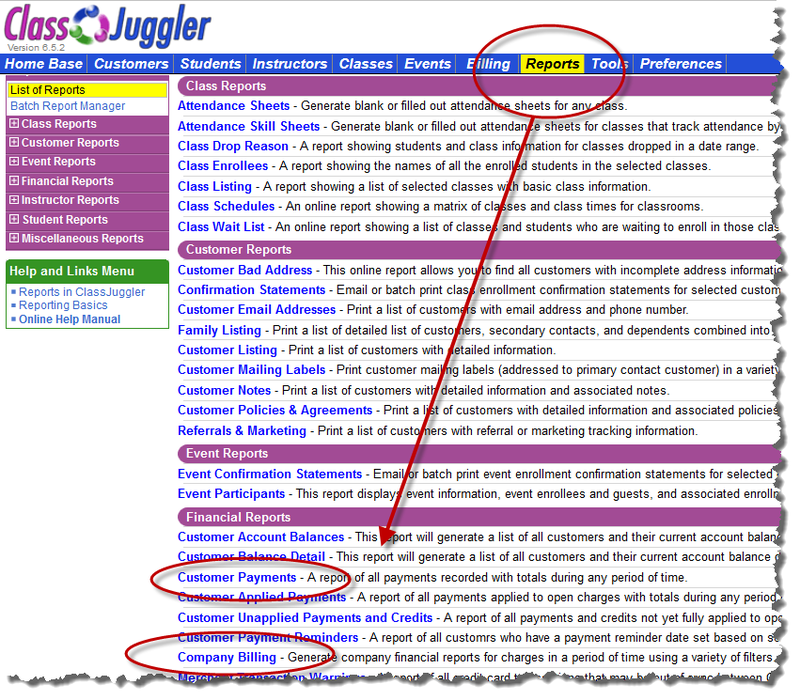 Get more and examples for each in our robust “Online Help Manual,” which you’ll find in the green Help & Links Menu found at the bottom left of every screen in ClassJuggler. You can also contact us for personalized support. This entry was posted in Cheer ClassJuggler, ClassJuggler Dance, ClassJuggler Dojo, ClassJuggler Fitness, ClassJuggler for Franchises, ClassJuggler K-12, Music ClassJuggler, Product Info, Swim ClassJuggler and tagged business software for schools, financial reports for schools, school business software, tax prep for schools on January 2, 2016 by classjuggler.